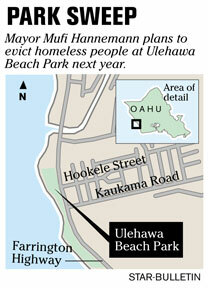 Ulehawa Beach Park will be the next target of Mayor Hannemann's cleanup efforts. 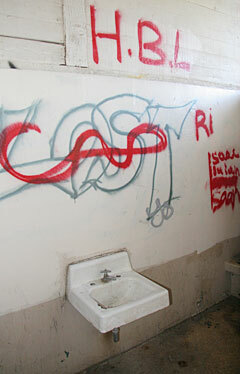 Campsites were numerous and the restroom was marred by graffiti. The city will close a 4-acre section of Ulehawa Beach Park in Nanakuli in February, forcing out squatters, as a part of an islandwide effort to clean parks, Mayor Mufi Hannemann announced yesterday. The area near Hookele Street and Farrington Highway includes the city's 4-year-old comfort station, which already needs repairs, the mayor said. While some community members anticipate regaining another park for public use, those living there will have to relocate in an area where shelters and open spaces are already crowded with homeless people. If Debbie Perdy were forced to move from her tent on Ulehawa Beach Park in Nanakuli, she would find herself on the streets of Waianae again or camping in another park. "On the streets I had to sleep on sidewalks and bus stops," said Perdy, 43, who has been homeless for eight years. "It's nice having a roof over my head, and I don't have to walk miles to shower. I don't know where I'd go." Perdy might soon join hundreds of homeless people who have relocated since last year as the city continues its campaign to close and clean Oahu's parks, this time targeting a section of Ulehawa Beach Park. At a press conference in front of community nonprofit organizations, Mayor Mufi Hannemann announced yesterday that city workers will clean the Nana Kai section of the park in February. City workers will close the 4-acre area on Farrington Highway near Hookele Street and repair a comfort station, picnic tables, benches, a parking lot and a roundabout. Hannemann said the city chose this section because it includes the comfort station, which needs repair despite being just 4 years old. The city will decide on the park's closure dates next month. "What is happening there, and it's unfortunate, is that it's one of our newer parks and getting to the point where it needs a cleanup," Hannemann said. The city's islandwide park cleanup project started with Ala Moana last year, resulting in the displacement of hundreds of homeless. After receiving positive feedback from community members happy to regain use of the park, the city conducted major cleanings in at least 15 other parks, including Thomas Square, Maili Beach Park, Pokai Bay Beach Park, Pupukea Beach Park, Mokuleia Beach Park and Queen's Surf Beach Park. "When we do park cleanups, it's based on need and not just to chase the homeless out," said city Parks Director Les Chang. Some residents said their parks have long been occupied by homeless people sleeping in tents, and welcomed the city's efforts to keep the area clean. "The community has finally gotten back the parks," said Nanakuli resident John Kaopua, who is also a member of the city's Community Benefits Advisory Committee. "Our kupunas and children can walk through the parks feeling free and safe." Other residents said they were concerned with the homeless constantly being displaced and moving from one park to another. "Our leaders have to find more low-income housing," said Clyde Basso, a Nanakuli resident. Hannemann said the city is giving advance warning of the park's closing to give state and nonprofit agencies time to help relocate the people who will be affected. The city does not have a housing department. The state opened an emergency shelter in Waianae this year that can house 275 people. In addition to the Ulehawa Beach Park cleanup, the city will spend $1.5 million next year to upgrade 37 parks, nine recreation buildings and 15 ball fields on the Leeward Coast.